Conveniently located on the first floor of the J.D. Williams Library, Studio One combines a simplified video recording studio with a fully supported digital editing suite. Following the Penn State “One Button” studio model, the digital recording technology can be used without any prior video production experience. The studio is completely set up for you with lights, camera and recording software. All you need is a flash drive to store your project on. Just plug it in and push a single button to turn on the lights, camera and start recording! When you are finished, remove your flash drive and everything will turn off. If you need to make some edits to your video, add a title or audio, the adjacent editing suite will provide you with the means to do that. The editing facility will contain at least one Mac with a quality headset and microphone. Editing computers will have basic and advanced editing software, as well as a tutorial website designed to help you get started with digital editing. Need more help? Just ask a librarian! We are asking YOU to help us reach our goal of $20,000 to purchase the required technology for Studio One. The University and Library will cover all costs for facilities, electrical work and technology mounting for these two rooms. Studio One was selected for this crowdfunding campaign based on student feedback. Students ask the Library for more technology than the Library can currently provide. Specifically, students routinely ask for video creation technology to support an increasing amount of course work that incorporates media and multimodal learning. In an incredible act of generosity, Ole Miss Athletics has committed to match every contribution we receive up to a total of $10,000. So your contribution will essentially be doubled! The matching gifts will be tallied daily and added into the total amount raised the following day. Select a donation perk listed in the right-hand column or choose your own donation amount. Whatever level you decide to contribute to Studio One will be doubled by Ole Miss Athletics. You will also receive all perks at levels lower than your donation level! Please know that 100% of the funds you donate will go to support Studio One. Thank you for your consideration and we hope you will help us meet our goal to build Studio One by the fall semester of 2015. 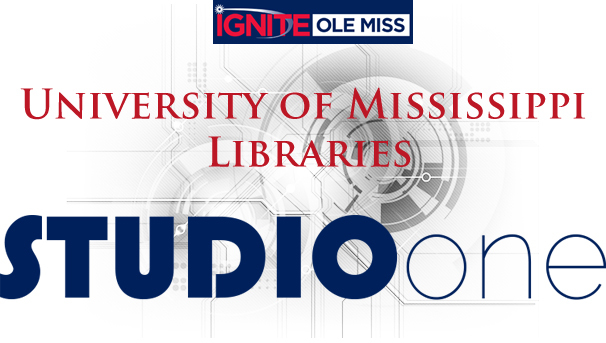 Join me in supporting the University of Mississippi Libraries Studio One project and provide much needed video creation technology for the benefit of all Ole Miss students, faculty, and staff. Your donation impact will be doubled thanks to the generous offer of Ole Miss Athletics to match all gifts up to $10,000. Your charitable donation is tax deductible. Donate: https://ignite.olemiss.edu/studioone and Tweet #UMStudioOne.